It’s practically a Christmas decorating rule: If you have a fireplace, you hang the stockings by the chimney with care. And that’s just the beginning. 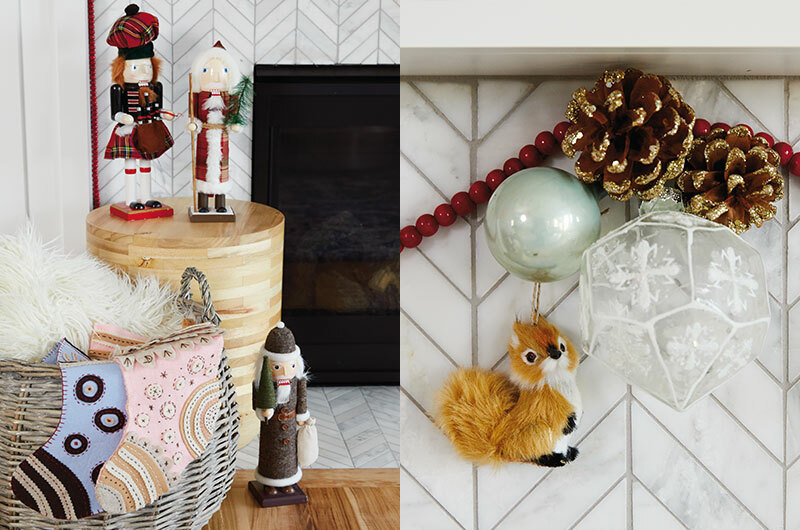 To find out how to decorate a mantel with style, we invited ourselves into three Hallmark designers’ homes to see each of their unique aesthetics on display- from modern Colonial, to natural and kid-resistant. They combined their own decorations with some favorite new pieces. 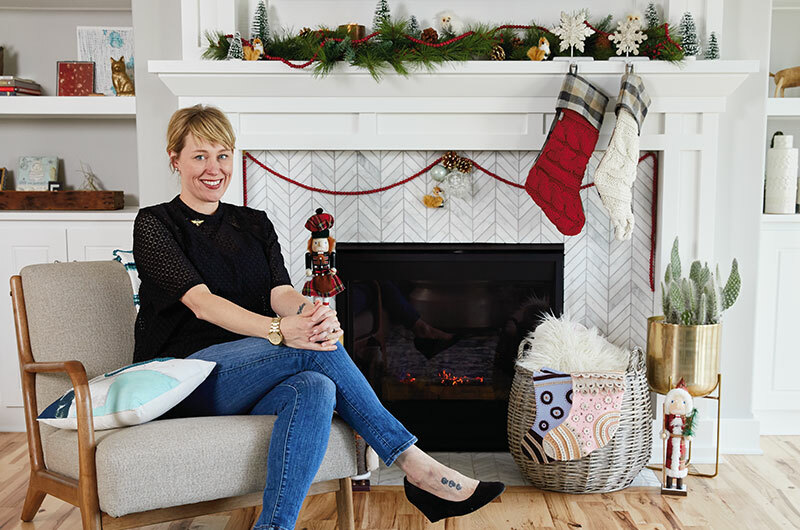 We’ve broken their advice on how to decorate a mantel for Christmas into simple pieces: mantel inspiration, decoration approach, mantel styling tips, and a few of their favorite things peppered in for fun. 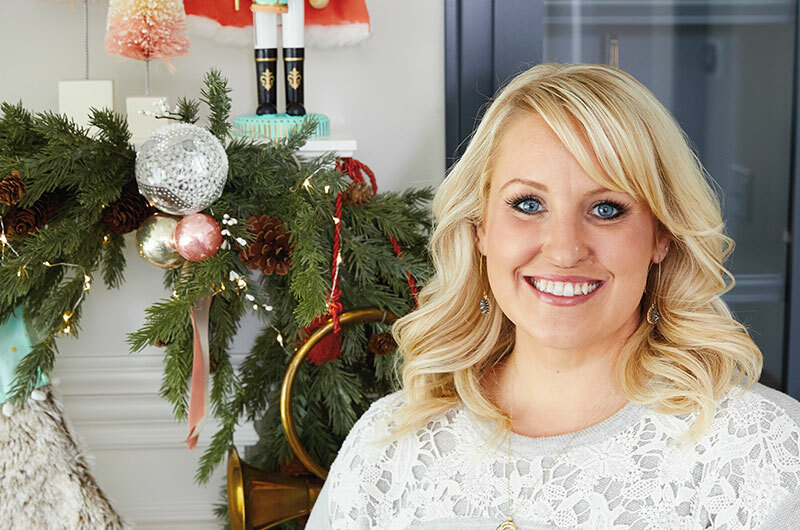 Here’s their holiday mantel decorating advice. It started with nutcrackers. And then I made the stockings—the fabric on the top is from the table runners at our wedding. We didn’t really have a theme but our colors were navy, coral, and mint. They don’t sell nutcrackers in coral and mint (yet!) so I got store-bought ones and painted over their outfits. I wanted to do something unexpected. I’d call my style warm but whimsical. I’m from the south but went to SCAD (Savannah College of Art and Design), so colonial mixed with modern simplicity is kind of what feels like home to me. Actually, that’s kind of what’s going on with that whole wall: a colonial mantel between modern bookcases. And décor-wise I like things to feel comfortable—which to me means not crowded or overdone. Don’t make everything symmetrical. Start with a focal point, and balance everything around it. I hung the stockings, then visually balanced everything from there. A lot of the pieces I keep out year ‘round are purposely neutral so I can keep them out with lots of my seasonal décor. Some stuff is everyday: the basket, the blanket, the white canister. Make it easy on yourself. I use artificial greenery that I don’t have to water. Lights with timers. And those awesome candles that turn themselves off. You can never have too many twinkly lights. In fact, at Christmas I like the entire house powered by holiday lights only. If you put up enough trees, you don’t have to turn on any other lights. I think we’re going with three this year. My record is nine. The horn came from my parents’ house and was out at Christmas. Things like this makes our new place feel a little bit more like home. Just put out what you love. You never get tired of looking at things if you truly love them. I’m from Colorado, and I love animals and nature. So I started with greenery—it’s a seeded eucalyptus garland. I love the Birch Tree Branches because my fireplace doesn’t work—this way I have the light and warmth. The little cabin in the lantern seemed like something you’d find in the forest. And I always have these owls. 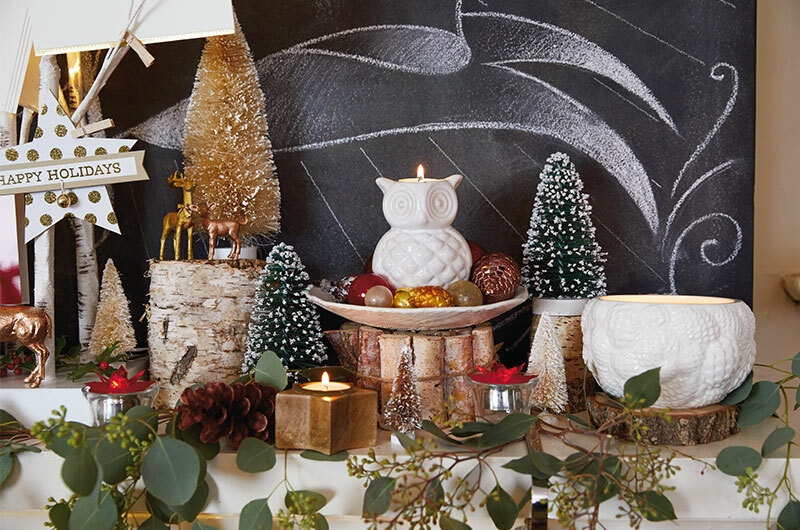 This year I really wanted to focus on mixing things up: Metallics with natural materials. Modern and vintage. Mixing textures and incorporating opposites. I like finding out how you can bring in things that don’t seem like they should belong together. The secret is having a common element to hold it together, like a theme or color palette. Light is always an important part of the mantel—it puts you in that warm mood. So there are always candles. Also, putting some glass in there to add sparkle is important. I put tea-lights in glass holders to give light and a little bit of sparkle without being too much. You want your eye to move around the space. I made a triangle to draw your eye up and down. And I used aspen logs to create height—that way you’re not limited by the flatness of the mantel. Play with the space in the room, too. Draw people in from a distance, then create little things for them to look at when they get close. There always have to be Christmas cards. I love them, and displaying the cards is always a challenge. I never would have thought to put the smaller birch branches up on the mantel, but it creates height, has lights, and has a purpose—so it works. I just attached cards to the branches with little wooden clothespins. Sometimes I wish there wasn’t a TV above the mantel, but this is the room where we gather during the holidays. 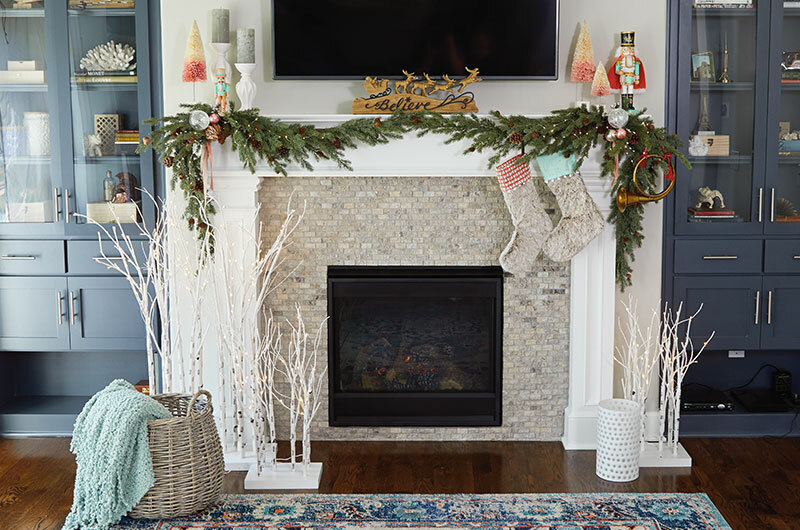 We’re all nestled in and watching TV, and we have this whole mantle thing to set the mood and get into the season. I love some woodland critters—that’s what our whole tree is. I like little surprises throughout the greenery, so there are some owls and squirrels in there. And I love the nostalgia of the bottle brush trees. 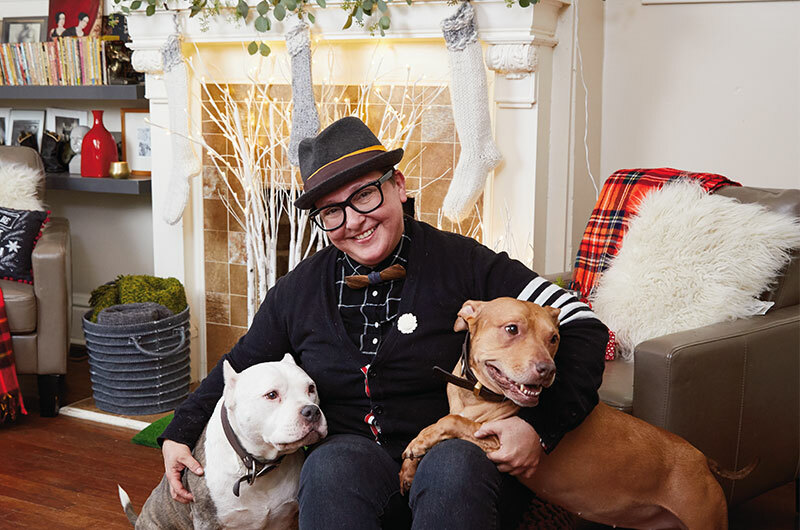 Everything’s pretty simple in my house because there are four animals and two children and Christmas isn’t about cussing. All of my holidays are about strategizing to keep the ornaments and decorations alive. Before the children, there were no cats. Now there are cats and children. 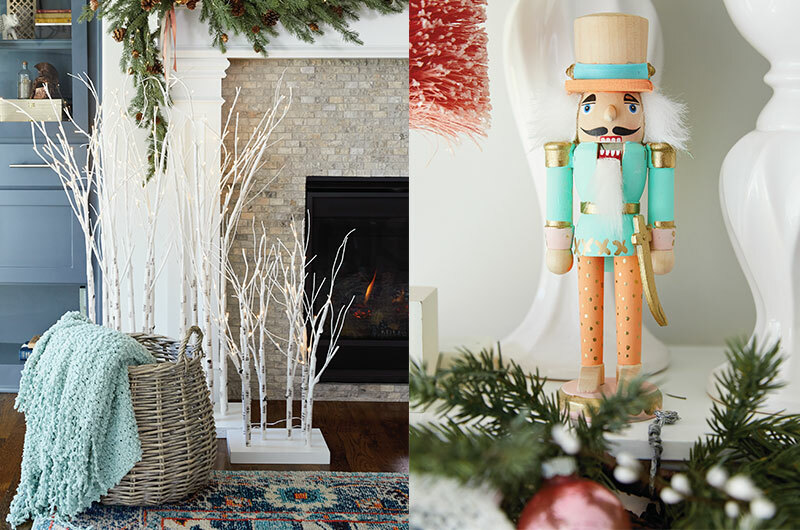 This will be my entire holiday season: “Don’t touch the nutcrackers. Don’t touch the nutcrackers.” The ones that are really detailed, I just don’t bring out. I couldn’t put big things on the mantel because of the TV, so I worked down. That’s why I did the red beads and the ornaments. I love the basket with the big fuzzy blankets. In our old house, I would have been more careful about keeping things away from the hearth, but this is the fakest fire ever. We have a fairly new house and I didn’t want to nail into the mantel—once I start putting holes in things it’s downhill from there. I use Joe’s Sticky Tape: Our photo stylists use it to hang pictures and stick things to shelves. I don’t do tons of glass or big bauble-y ornaments because kids and animals. I think this year even my feathered birds will be a problem—one of those owls is probably going to bite the dust. 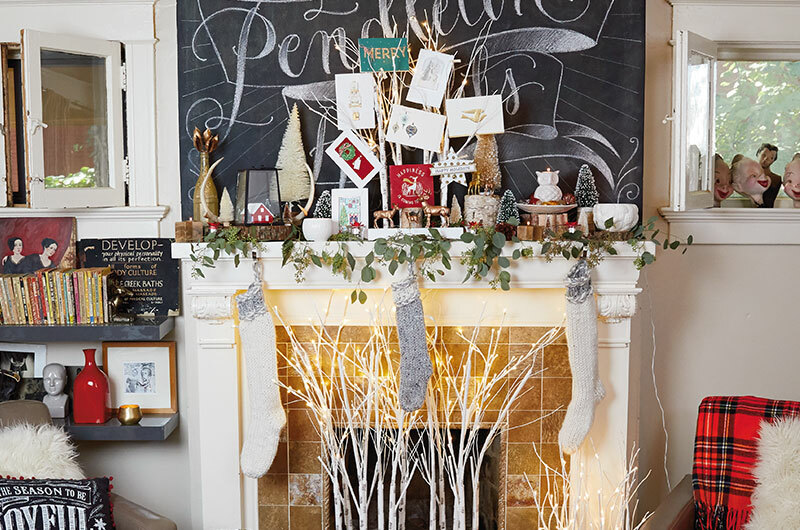 The whole purpose of a mantel is stockings, so this year I’ll be shopping for more stocking hooks. We have eight: two cats, two dogs, four humans. I wait to put all those up until later, because at their age, the kids will grab them and pull them down to see what’s inside. I love the lights. I love the illumination of the fire below and the twinkly lights above. That warm happy Christmas feeling that goes away December 26 and you feel like you’re getting stabbed in the heart…yeah, I take Christmas seriously. I’m collecting nutcrackers. I intend to buy one or two every year. I’ll eventually get so many it gets creepy and will freak me out when I go downstairs.